The route through the exhibition passes through 4,000 square metres spread out over three floors. Prologue and epilogue are in the prestigious reception hall, which features a huge media facade lending dynamism to the exhibited vehicles of the Hyundai corporation: the latest cars and selected vehicles of the World Rallye Championship (WRC), in which Hyundai has been involved for many years. In between, visitors to the exhibition undergo a fascinating journey of discovery, finding out about the raw material steel, the production and research as well as how the vehicles are ‘born’ in the design department. In the ‘Plant’ section, they can see how the vehicles are manufactured with the help of industrial robots and they themselves can also become active. 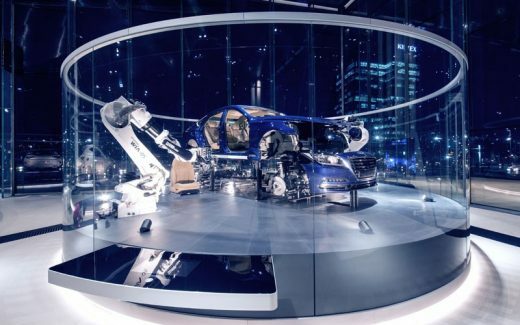 They experience how steel parts are stamped and shaped, control welding robots, change bodywork paint and build vehicle components such as windscreens and seats into a real car. The individual stages of production are presented in large glass cylinders and can therefore been viewed from all angles. Once per hour the robots interrupt their work and perform together a classical ballet. 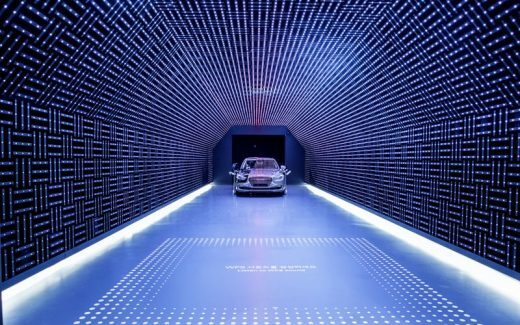 In the ‘Innovate’ section, five impressive three-dimensional installations introduce different aspects of automotive research. 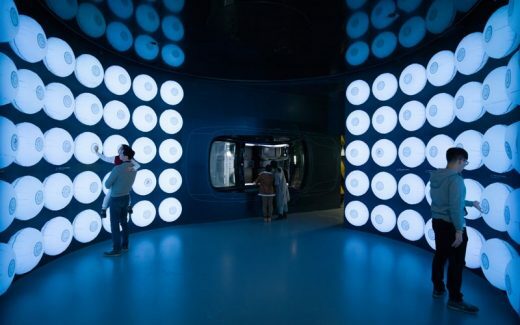 Luminous, interactive airbags, arranged to fill the space available, give visitors the feeling of being comprehensively protected. A large-format film shows a crash test up close; it is combined with a real test car. And in the ‘Wind’ room, aerodynamics are made visible to the naked eye. The visitors discover the meaning and the importance of the sound design via a 3D sound system, which plays back vehicle and instrument sounds and is combined with light animations. The ‘Powertrain’ room at the end of the route contains a walk-in engine that makes it possible to comprehend how everything works and what actually happens. Five room-high panes of glass form cross-sections through a larger-than-life engine. Animated light contours then show how vehicle components interrelate with each other and what processes take place when the vehicle is being driven. The highpoint of the exhibition is a kinetic sculpture located on the top floor of the building. Visitors reach it via a lift that prepares them for the experience. A film in the lift opens up to the design area and draws the visitor into the car creation process. The strip of monitors spaced around the room are choreographed together with the sculpture. 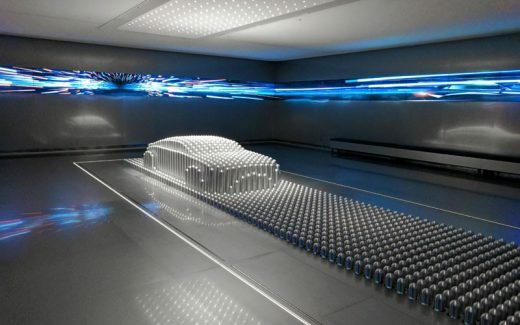 1,411 shining aluminium rods, arranged in a tight gridwork pattern, occupy the centre of the room. They form a 20 square metre, elongated rectangle formed out of the outwardly flowing, sculptural shapes – in continuous dynamic motion. Each rod has its own drive and, within seconds, can reach a surprising height of up to 1,40 metres. 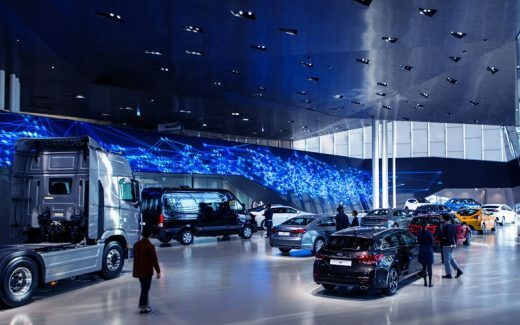 In reactive mode, the rods react to the movements of the visitors, whereas, in show mode, they express the Hyundai design philosophy ‘Creating Design from Movement’. The flowing movements finally end in the design language of a Hyundai automobile.